The Urban Politico: Should Cory Booker Seek a Higher Office? We all knew this day would come, sooner or later. 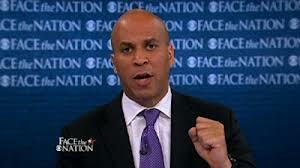 Talks of Newark Mayor Cory Booker exercising his political ambition, and seeking a higher office. Cory Booker is perhaps my most favorite politician. He's my favorite because he is not perfect, and forces me to flex my brain power when analyzing his political moves and positions on certain issues. He makes me happy and pisses me off. I've spoken favorable about him here and criticized him here. However, at this point my opinion or thoughts probably don't mean squat, because I live in New York City and am not a resident of Newark or the State of New Jersey. Even though New York and New Jersey like to interject themselves into the issues and politics of each others state, an intelligent argument about Mayor Booker's moving forward in politics, must come from the people who know him best and will be most effected by his decisions regardless of what political path that he takes -- the residents of Newark and the people of the State of New Jersey. So, I am going to sit this one out, hopefully guide the conversation and ask that you, the great people of New Jersey weigh in and let your voices be heard. Speaking with Bob Schieffer, Booker told the nation, "I am absolutely considering running for governor, as well as giving other options some consideration." I am torn on this, so I really want to hear your thoughts. If Cory Booker runs for Governor does he have a good chance of beating Chris Christie? What changes would Governor Booker bring to New Jersey?